One of the best decisions I’ve ever made was starting my blog! It gave me a creative outlet to express myself and help others in the process. You might be thinking of starting your own blog too, but you’re still a bit skeptical. This is why I made this post. 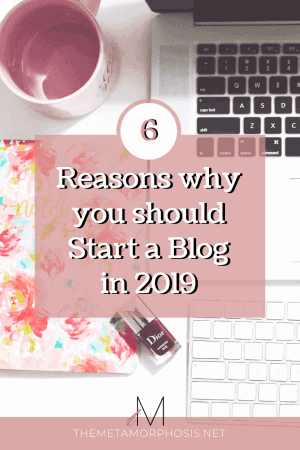 In this post, I’m going to let you in on the 6 reasons why you should start a blog in college, the ugly truth about blogging, and how to start your own blog! *Affiliate links are used in this post, read my full disclosure here. Having a blog gives you full creative control of your content. You can write about whatever you want! Even if you think you aren’t that creative, I guarantee you that you will tap into your inner Picasso when you start your blog. I thought I was a numbers person and that creativity just wasn’t my thing. But I’ve grown to love being creative and letting ideas flow from my head to help others. If you want to have a professional and successful blog, you’ll have to get used to the idea of thousands of readers seeing your work! Also, you have to be comfortable enough to share a bit of your personality in your posts to connect with readers. The other elephant in the room is how much of your personal life you reveal. We assume that if we create a presence on a public platform that we have to let others in on our personal lives, but you actually don’t! I know of many successful bloggers that don’t have their private social media accounts on their blogs. At the end of the day, people just want you to help them solve a problem. So if you’re doing that, you don’t necessarily have to publicize your private life. The decision is yours! If you’re planning on having a professional blog, this could be a great thing to add to your resume! Especially if you’re a communications major focusing on areas like journalism or public relations. It shows that you’re a self-starter. The more successful your blog is, the more bragging rights you’ll have. And don’t worry if you don’t average thousands of views yet, your blog still proves that you have an entrepreneurial mindset. It also shows off your communication skills. If you’re excelling in an area or have great experiences that you think will benefit others, share it! You might not think it’s that big of a deal but someone out there could be hoping to discover the kind of content you can provide! 6. You can make money! Your blog can either be a hobby and a creative outlet, or it can be a business. There are bloggers making a full-time income on their blog! If you have an idea for a product/already have products/or provide services, your blog can be a great platform to boost your sales and get brand recognition. Even if you don’t have a product, there are many other ways to make money blogging. In my FREE How to Start a Blog e-course, I talk about the 4 main ways to make as a blogger. Sign up below to get these tips! If you want to start a successful blog, you need to know the hard work you’re going to have to put in. It is not an overnight success! Don’t get me wrong, I definitely believe that starting a blog is one of the best things you can do in college or in general, but I think you should know both sides of the story. This is in no way meant to discourage you, but rather inform you. If you want to have a successful blog, you need to be willing to invest your time and energy into achieving that goal. You also have to be patient to see the results of your hard work! It takes time to learn how to run a successful blog, it takes time to get organized and plan your strategy, and it takes time for your blog to bear the fruit of your labor. The truth is, you have to make a few investments to have a successful blog. The very first investment is purchasing your domain and hosting (sidenote: I created a comprehensive guide on how to do this here). After that, if you want to boost your blog traffic and make money from it, your best option is to invest in some courses and ebooks. However, these investments are relatively minor compared to the money you could make from your blog with the right knowledge. I’ve invested in a few courses and ebooks this past month and I’ve already seen the return on my investment! When I first started my blog, it took me months of research to figure out how to achieve success in different areas. I wished there was a one-stop shop to give me all the information and tools I needed on having a successful blog. If you’re dealing with this same problem, I would highly recommend my FREE How to Start a Blog email course! I also created a comprehensive article on How to start your blog in 2019, and How I went from 200 to 100,000 monthly views on Pinterest in ONE MONTH! Plus, I also help you choose the best email marketing tool to grow your email list when you start your blog. You can read my review here. Use these resources as you go through my free email course on creating your successful blog. P.S. You don’t want to miss out on these college posts!